When Parents Suffer the Loss of Expectation - Dr. Matt Hersh - Awareness. Compassion. Empowerment. Isn’t it just so frustrating and stressful when things don’t go your way? We should be able to have our cake and eat it too. Right? But who ever said life was supposed to cooperate like that? Now, believe it or not, I’m all for visualization, energy, and spiritual exercises that are designed to align our deeper motivations and energies with our outward actions so that we draw more positive energy, relationships, and situations to us. And actually, despite my formal psychology training, I feel that there’s WAY more than meets the eye with respect to what we are capable of and how our minds and bodies work. With that said, it is a downright “crazy” notion to expect something to work out in a certain way just because we have a particular idea firmly established, consciously or not, in our minds. But that’s exactly what happened to me in a recent mental battle royal involving my 17 month old son’s nap time. My son has been furiously teething and just acquired a mild cold. He also is, as young children are want to do, rapidly developing all sorts of new skills and capacities. So there we are – he is rubbing his eyes, yawning, and making sleep noises. Am I off base to take these as clear signs he will go down easily for a nap? Yes, apparently I was way off base. Or rather I was off expectation. I had my own parenting expectations in those moments that he was “supposed to” sleep and sleep well. He was “supposed to” fall asleep quickly given how tired he was and how poorly he slept the night before. All this sound fairly reasonable, right? Parents of young toddlers: are you with me on this one?? But who says toddlers are reasonable? And who says he is supposed to follow the exact parenting plan I had in my head. When I step back for a moment, that actually sounds kind of ridiculous. My 17 month old was supposed to follow a plan I laid out perfectly and longingly in my head? So he didn’t sleep. Not only did he not nap at all, but he screamed so loudly for 45 minutes (no matter what I did) that my ear drums literally hurt. I sustained some emotional damage too. To add insult to injury, I had slept for a VERY broken 6 hours the night (and year) before, powerfully dissuading me from the capacity to stay mindfully present and resilient to the stress and loss of personal expectations being met. As a result, it all became such a struggle! And that’s what most of these situations really come down to: Unnecessary struggle. But there didn’t need to be a struggle. 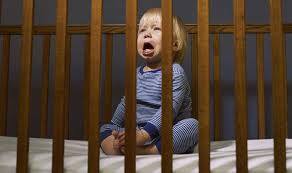 It was hard enough already – the teething, the pain, the loss of restful sleep, etc. My main mission with this Life Less Hard blog is to help others make their lives less hard. We can’t erase hardship. But we certainly can reduce the degree of unnecessary suffering we all feel and bring to ourselves – sometimes out of fear, shame, embarrassment, pity, righteous indignation, and even love when boundaries are not kept in check. So for that hour that I needlessly struggled, I could have cut my losses when my son was simply just not having it. I could have seen clearly the reality of the situation rather than taken an overly determined and inflexible stance on what was “supposed to” happen. I could have adopted a stance of radical acceptance. Please drop a comment below about your (parenting) experiences with unnecessary struggle and how acceptance perhaps saved you from unnecessary suffering. And if you like what you’ve read and want more from the Life Less Hard blog, sign up directly below!